A polar bear in the flooded bear enclosure in the Botanical Gardens. 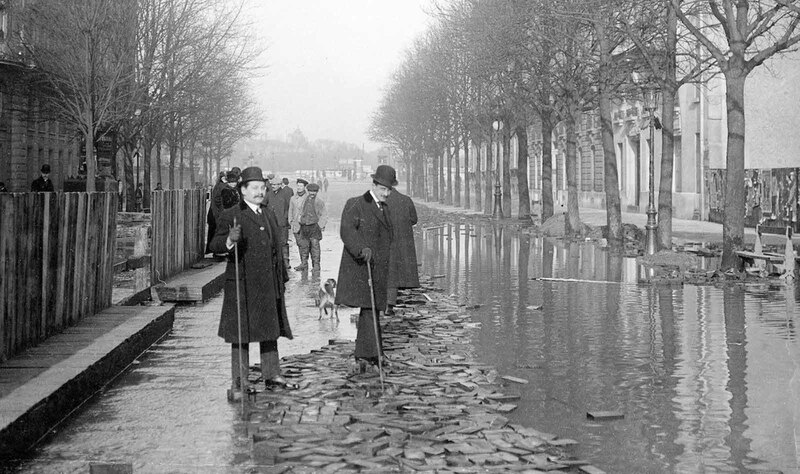 Winter floods were a normal occurrence in Paris but, on 21 January, the river began to rise more rapidly than normal. 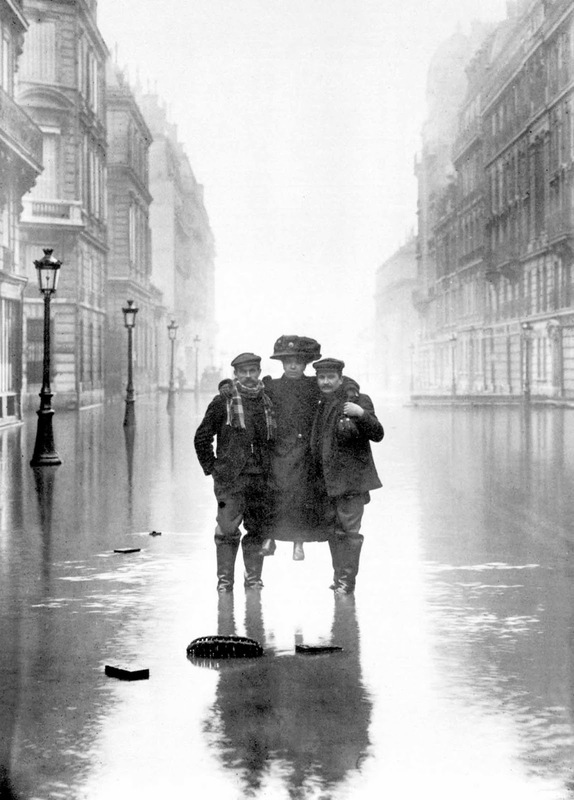 Over the course of the following week, thousands of Parisians evacuated their homes as water infiltrated buildings and streets throughout the city, shutting down much of Paris’ basic infrastructure. 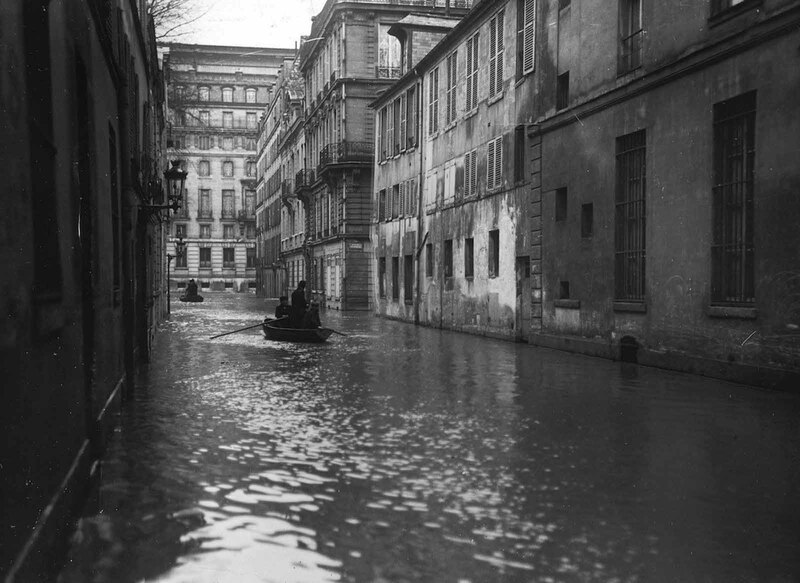 Police, fire-fighters, and soldiers moved through waterlogged streets in boats to rescue stranded residents from second-story windows and to distribute aid. 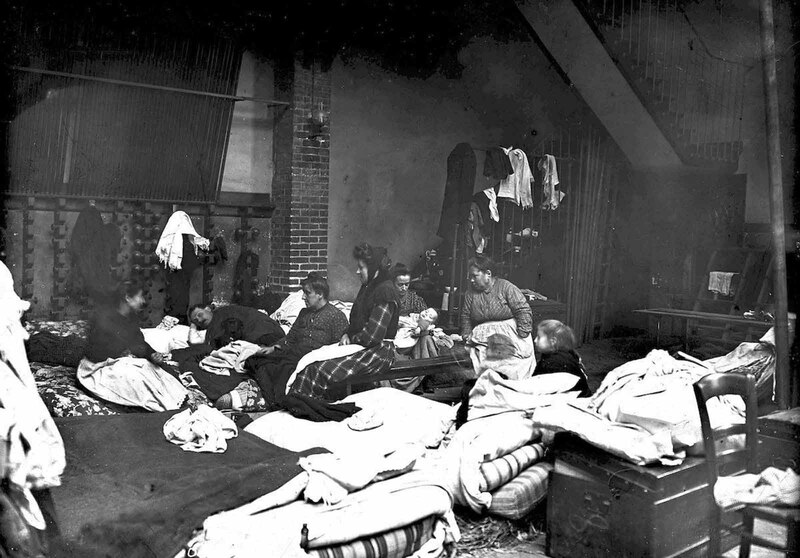 Refugees gathered in makeshift shelters in churches, schools, and government buildings. 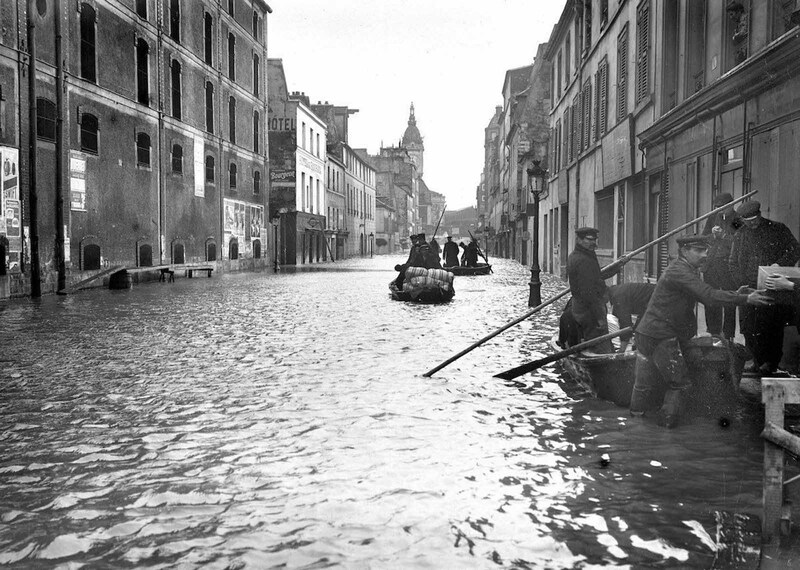 Although the water threatened to overflow the tops of the quay walls that line the river, workmen were able to keep the Seine back with hastily built levees. 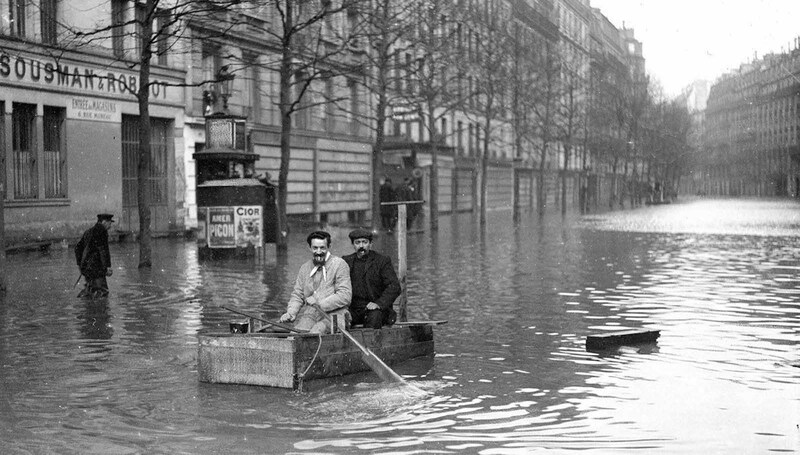 Two men travel down the street in an improvised boat. 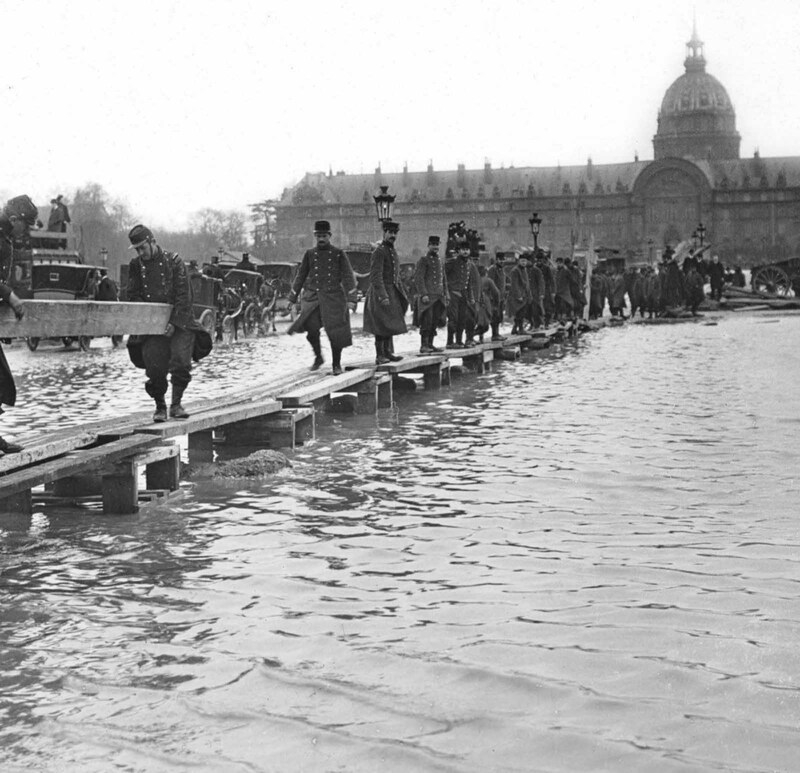 Once water invaded the Gare d’Orsay rail terminal, its tracks soon sat under more than a metre ofwater. 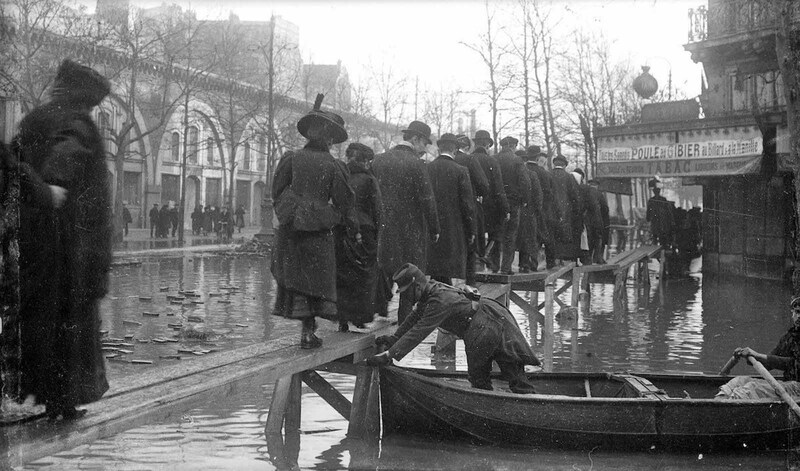 To continue moving throughout the city, residents travelled by boat or across a series of wooden walkways built by government engineers and by Parisians themselves. 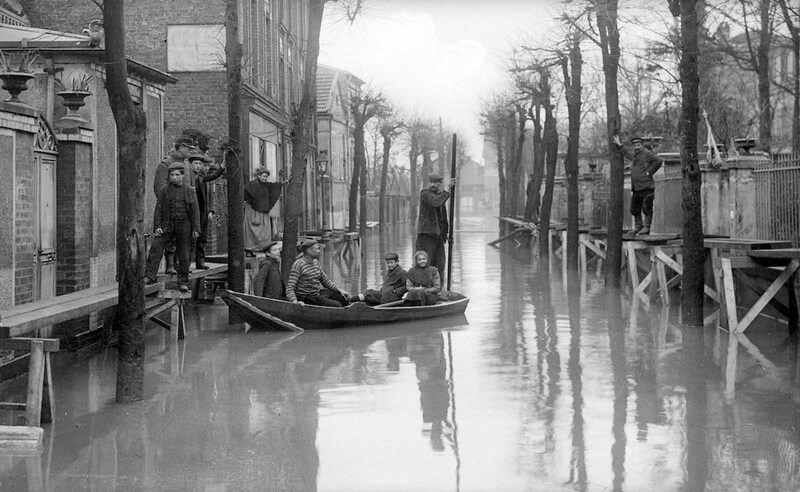 On 28 January the water reached its maximum height at 8.62 metres (28.28 feet) above its normal level. Amazingly, despite 35 days of flooding, thousands of evacuations and an estimated $1.5 billion (accounting for inflation) in damages, not a single person died during the flooding. This was partially thanks to the police and armed forces who’s well organized efforts minimized the effects of the disaster. The water achieved its highest level after 10 days and after 35 days the water was gone completely. 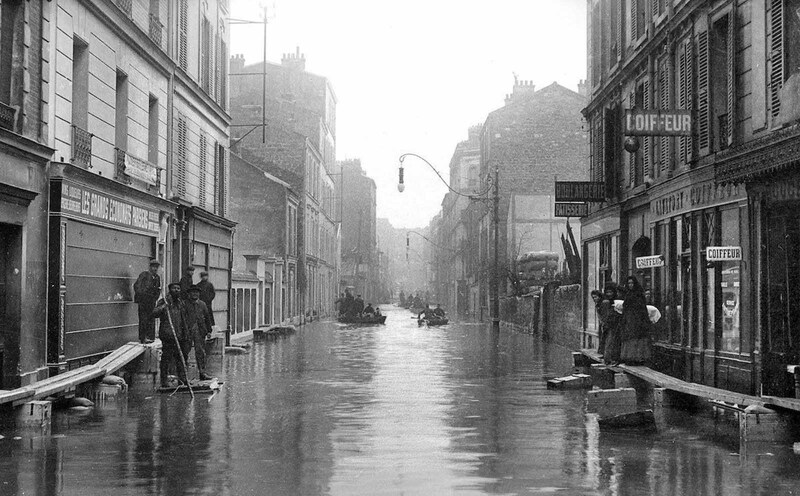 Rowing down the street in Poitiers (VIIth arrondissement). People skirt the edge of the street on improvised pathways. Three men talking to people at first floor widows. A street of Bourgogne (VIIth arrondissement). A street of the Universite (VIIth arrondissement). 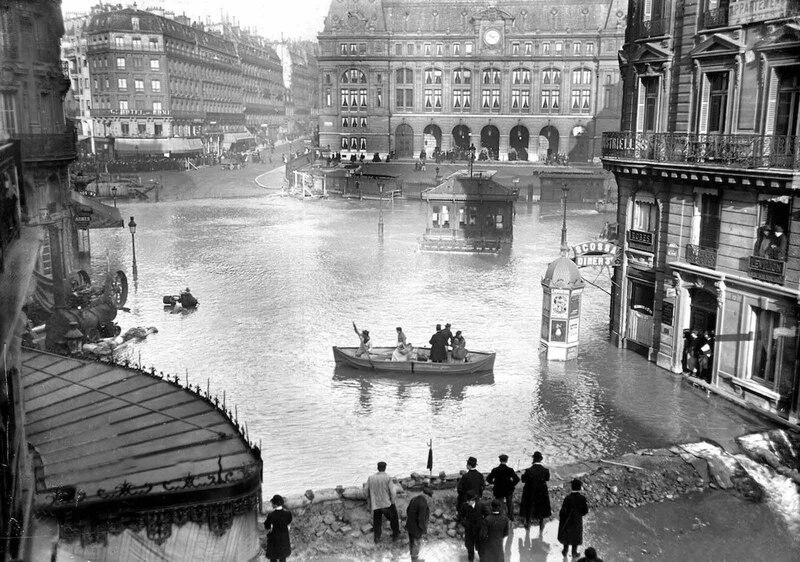 Paris is transformed into Venice. 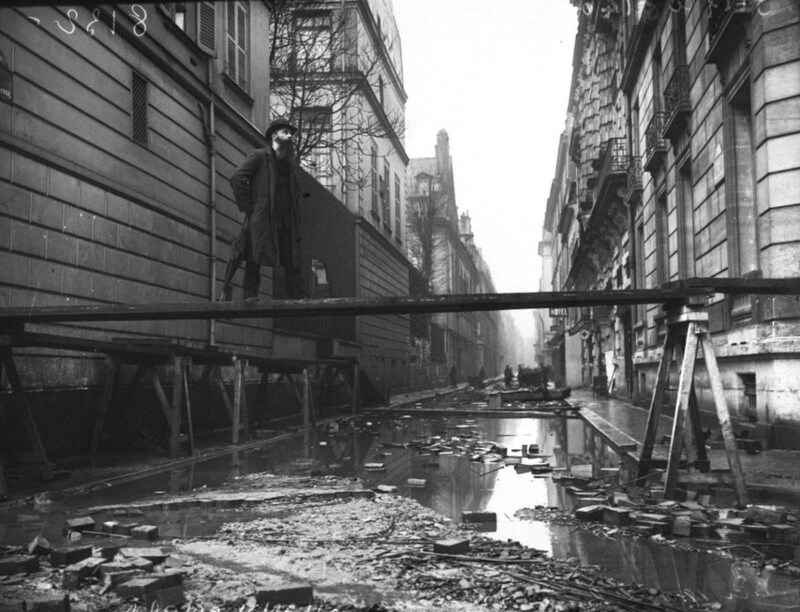 A bearded man stands on a high walkway. 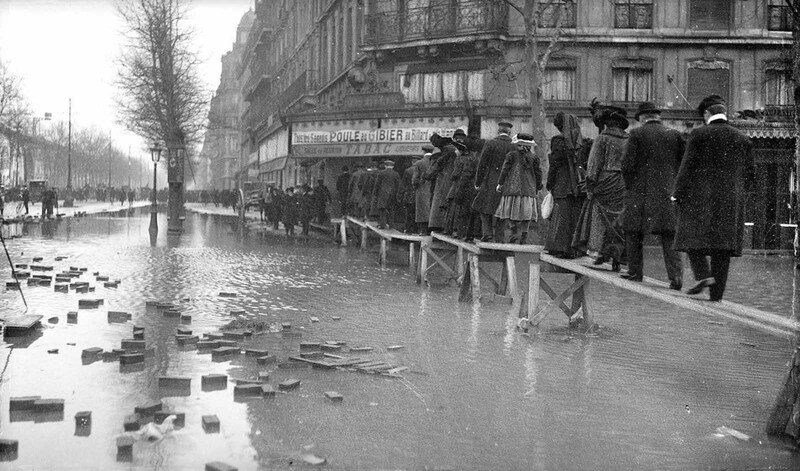 People gingerly cross the street on a wooden plank. 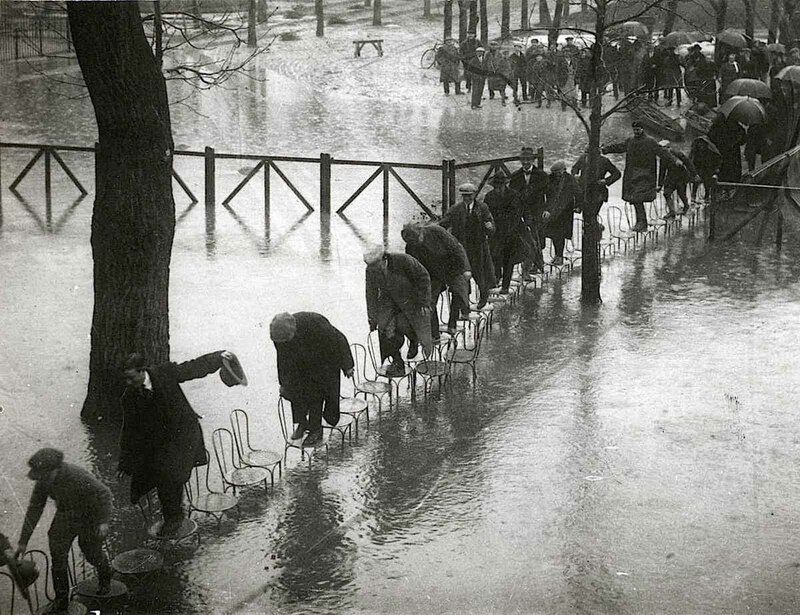 The army lays down a wooden walkway. 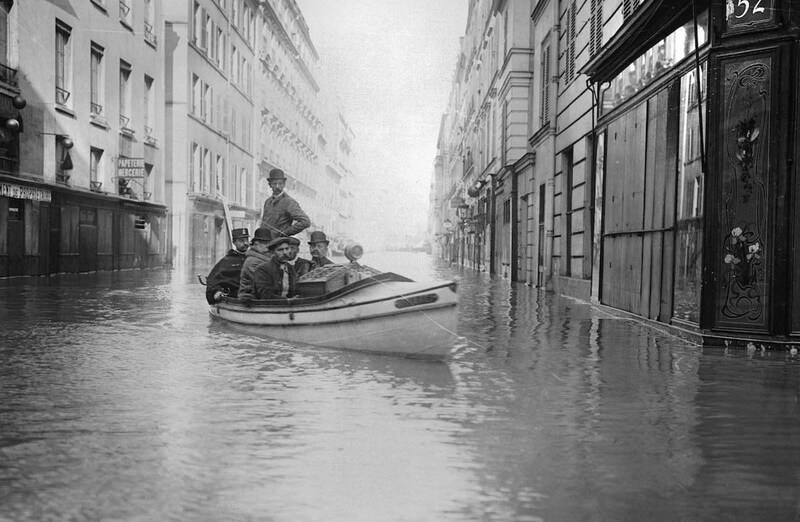 A uniformed man punts a boat as people at first floor windows look on. In front of Gare Saint-Lazare. 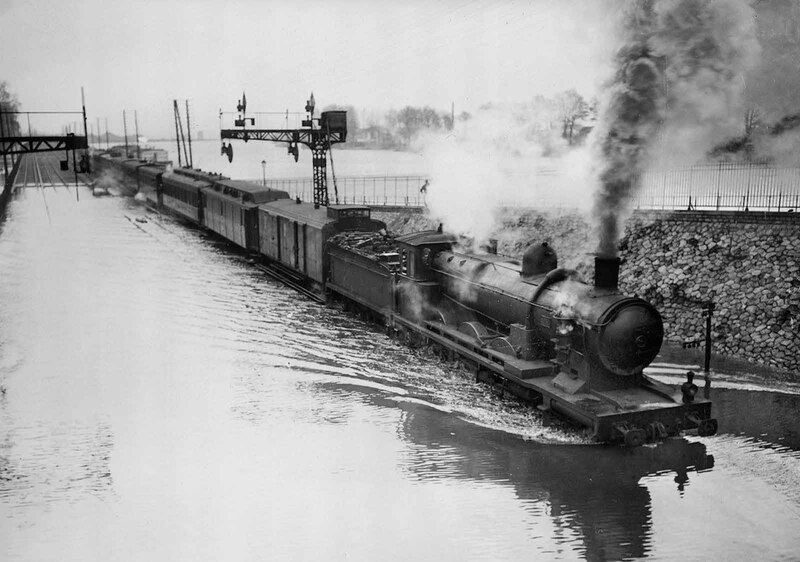 The Paris-Limoges express at the station in Choisy-le-Roi (Val-de-Marne). 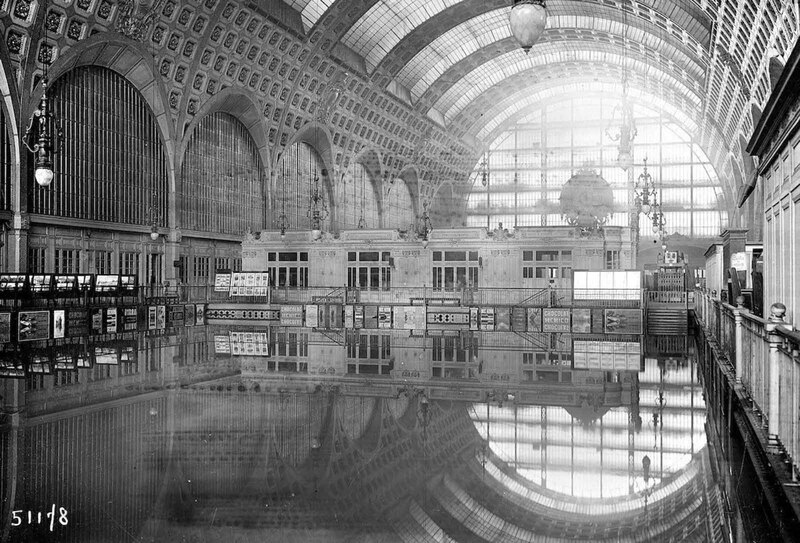 The interior of Gare d’Orsay. A shelter in a gymnasium. 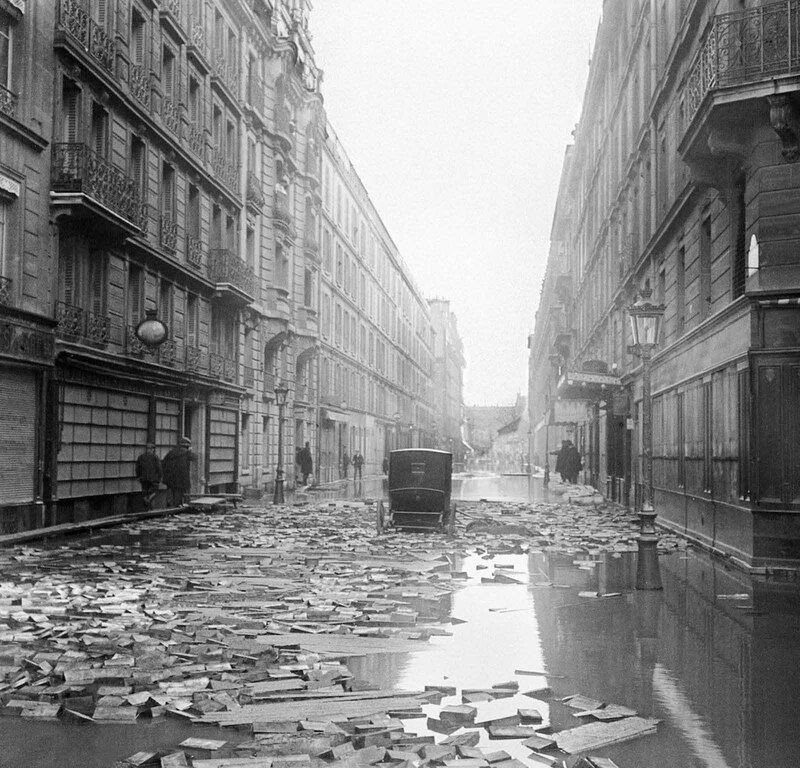 Wooden paving blocks are scattered on the ground, which is still covered with water. A carriage sits abandoned. A woman is supported by two men. 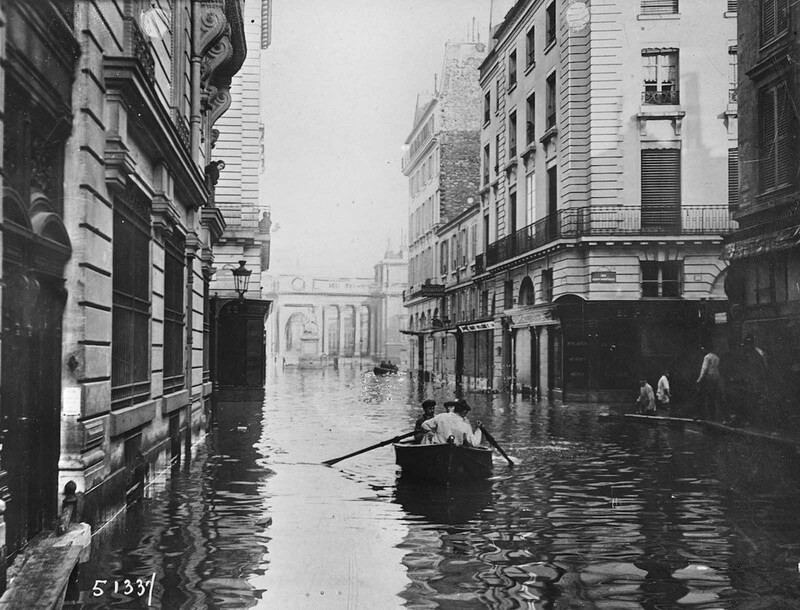 Proof that floods have always existed and are not strictly a modern-day phenomenon created by buzzwords like "climate change" or "global warming." 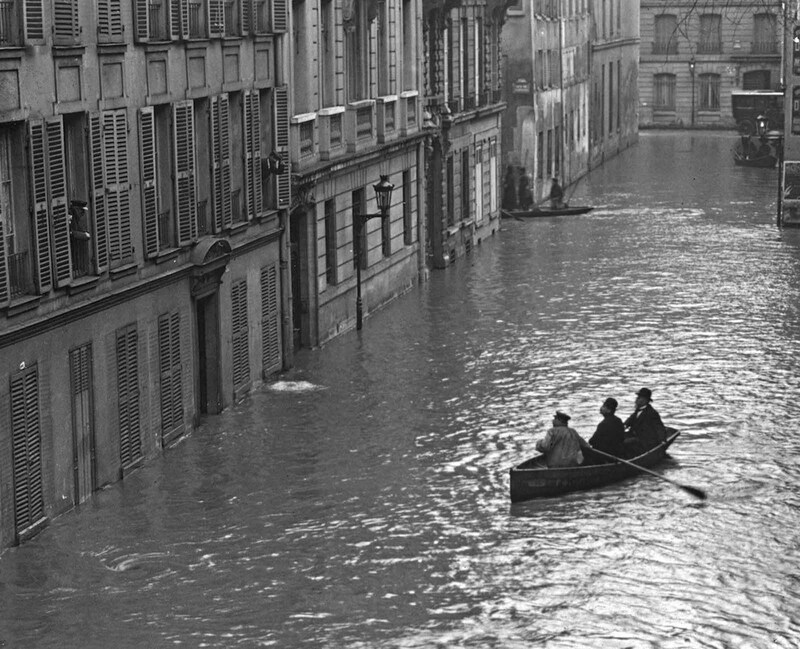 Nobody ever claimed that flooding was exclusively caused by global warming and climate change. Frequency and intensity, however, do increase. Please take the time to know the difference between weather and climate. 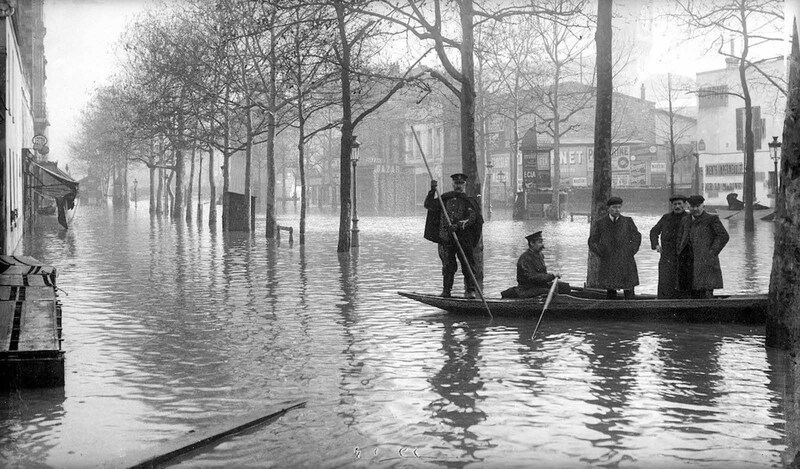 Plenty of people have claimed that floods were caused by global warming and climate change. As for global warming, studies by NASA indicate that areas suffering deforestation, such as in the Amazon, are actually getting cooler instead of hotter. Give it time and people with forget their latest hysteria and move onto something else. I remember when "ozone layer" and "greenhouse effect" were all the rage too. Sorry, allow me to clarify: Nobody who wasn't a climate-change denier with their head up their a$$ ever claimed that global warming CAUSED ALL FLOODS. Intensity and frequency have increased. It's a fact. Deal with it. As for some brief local temperature fluctuation in a barren patch of the Amazon-you are again confusing weather and climate. It is foolish to think that a single deviation among thousands of examples of changing weather somehow invalidates everything else. That would be like taking the 0.01% of cancer patients who went into spontaneous remission and claiming that cancer is a hoax. Carbon (a greenhouse gas) emissions increase. Global temperatures increase. Climate changes as a result. Climate also changes naturally. It never stays the same. You can't say frequency and intensity have increased and done so because of you doomsday phenomenon you clearly love to believe in. 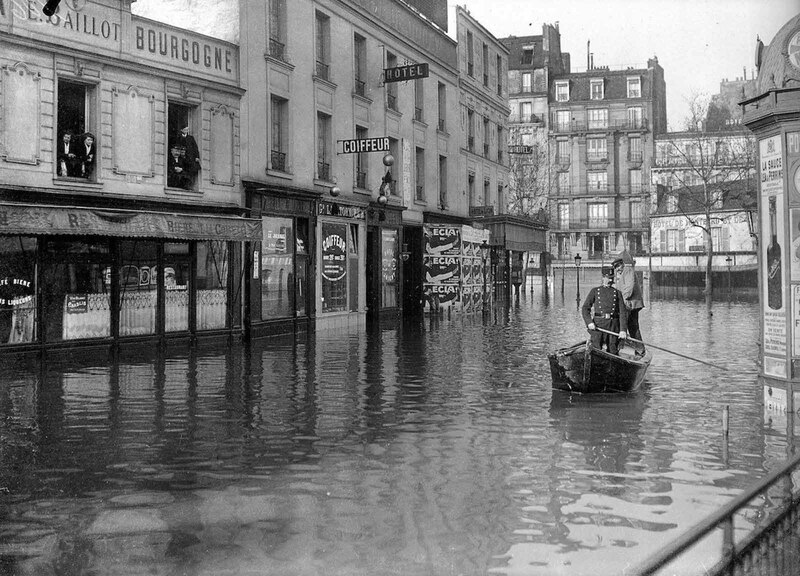 There have always been floods and they go back further than studies allow you stay frequency and intensity have increased. As for "confusing weather and climate," they are simply different words for much the same thing, like car and automobile. "It’s a fact. Deal with it." No, it's merely an opinion at this stage. NASA said that? "Most climate scientists agree...." How would they know, really? That is a misleading statement that is commonly cited as fact. I doubt that anyone really knows the number of scientists in the world, let alone each of their opinions on global warming. And how many of them work in scientific fields relevant to the subject to comment on it with authority? Still, making 'blanket statements' like that makes us feel good in the midst of debate and it often works as people often miss it. Interestingly, there is a website named The Petition Project that lists more than 30,000 scientists who have publicly declared their disagreement with the 'theory' of catastrophic man-made warming. According to that, most scientists DISagree. Only 32.6% of the papers in the controversial John Cook study actually stated a position endorsing "anthropogenic global warming." For the record, I don't deny climate change exists. The climate has always changed and continues to do so naturally. If it actually stopped changing we might have more to worry about. I only disagree with alarmists taking theories that it's man-made and a doomsday premise and passing it off as fact. I never said there was no difference between weather and climate, so don't worry about that. I only stated they are much the same thing. I couldn't have passed Earth Science at university if I didn't know the variation in meaning. "Most climate scientists agree the main cause of the current global warming trend is human expansion of the "greenhouse effect"1 — warming that results when the atmosphere traps heat radiating from Earth toward space"
"The difference between weather and climate is a measure of time. Weather is what conditions of the atmosphere are over a short period of time, and climate is how the atmosphere "behaves" over relatively long periods of time"
Thank you for fighting the good fight. I can't believe how strongly opinionated climate change deniers are. I am studying climate in University and informing people on the issue at hand is very dear to me. 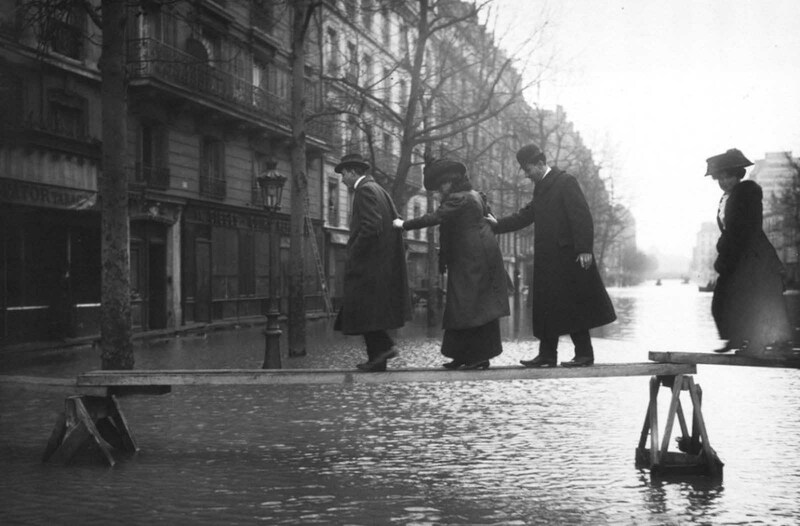 To add to that: Even though flooding was frequent in Paris a century ago, 1910 was extreme. Clear. So, according to some, this 1910 event means global warming / climate change anno 2020 is non-existing. Interesting conclusion. 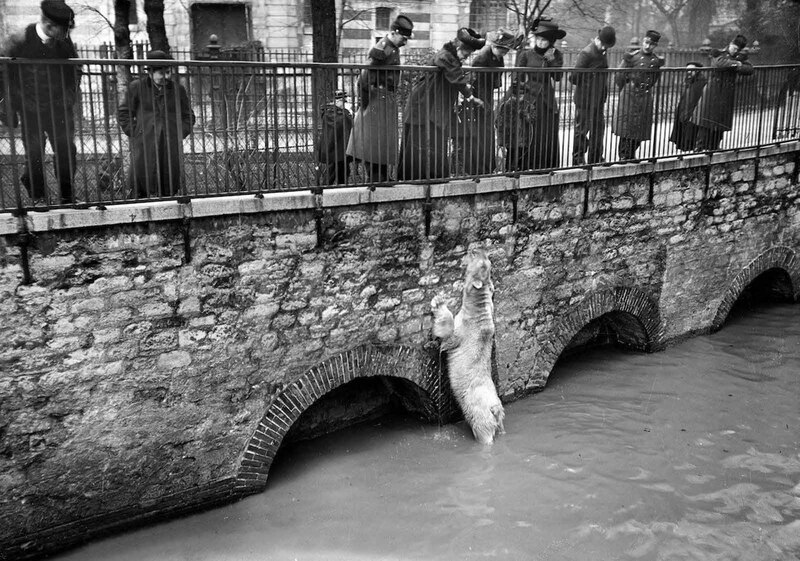 I wonder if they saved that polar bear. So sad to see him looking up towards the bridge.